Our recent rain (and a bit more last night) have caused then daffodils to burst forth. Even better, the temperatures have been cool enough that the blooms have hung around for a while. In hotter years, they often only get a day or two before fading. Narcissus /nɑːrˈsɪsəs/ is a genus of predominantly spring perennial plants in the Amaryllidaceae (amaryllis) family. Various common names including daffodil,[notes 1]daffadowndilly, narcissus, and jonquil are used to describe all or some members of the genus. Narcissus has conspicuous flowers with six petal-like tepalssurmounted by a cup- or trumpet-shaped corona. The flowers are generally white or yellow (also orange or pink in garden varieties), with either uniform or contrasting coloured tepals and corona. 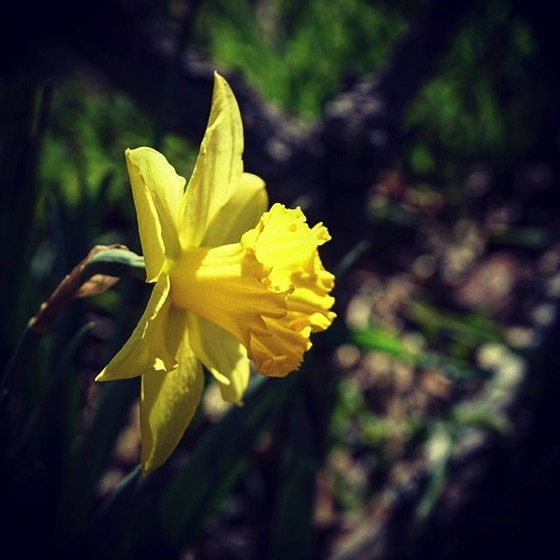 Tagged with: daffodils, floweringnow, flowers, flowersofinstagram, flowerstagram, garden, ig_garden, instagram, narcissus, nature, Outdoors, photography, plants, plantstagram, rainbow_petals, treestagram, yellow.